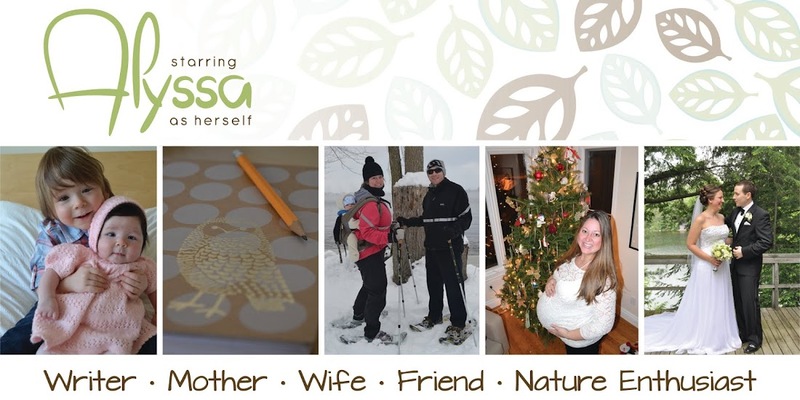 What a wonderful first day of our winter session! The weather was unseasonably warm and the sunshine made the snow sparkle. 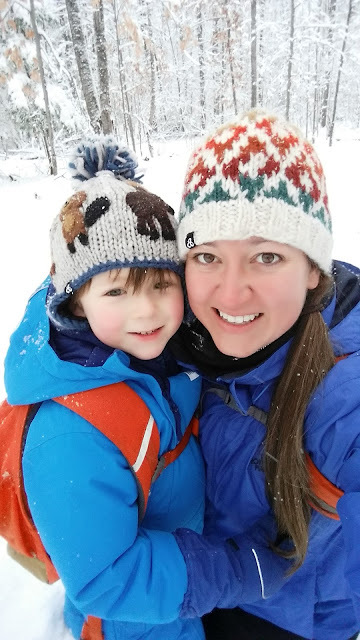 Our preschoolers wanted to explore the forest behind our cabin, so we went on a hike through the crunchy snow. 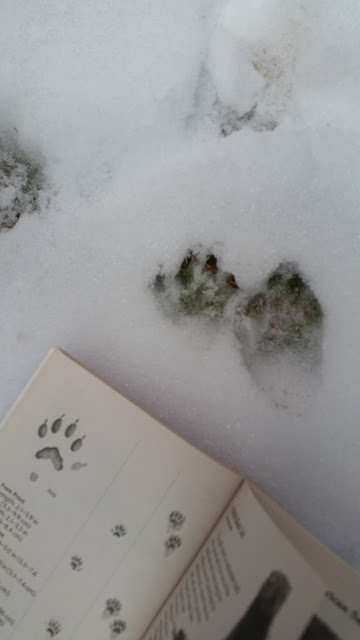 We heard a woodpecker in the distance and discovered animal tracks on the trail. Everyone paused to examine a pile of poop too. The kids are already learning about the different seasons as they noticed how most of the trees had lost their leaves, but the pine trees did not. The children found a tree with low sturdy branches that they wanted to climb. I observed the children making their own risk assessments during this activity. 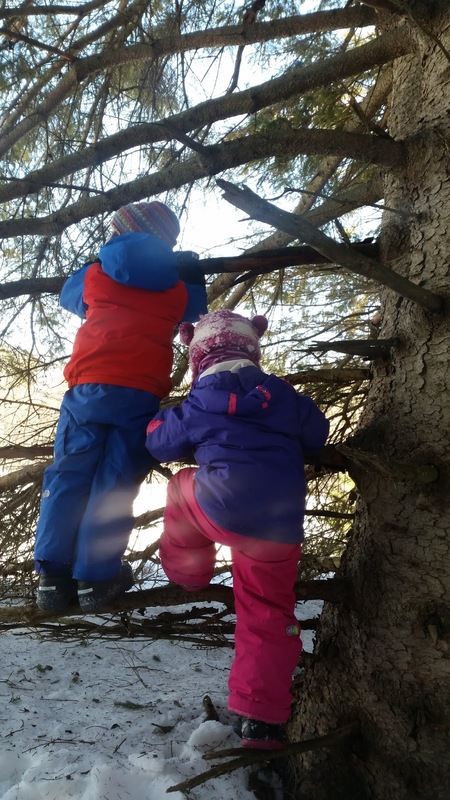 A couple of our preschoolers noticed how the snow had made one of the lower branches slippery and decided on their own that they weren't comfortable climbing any higher. 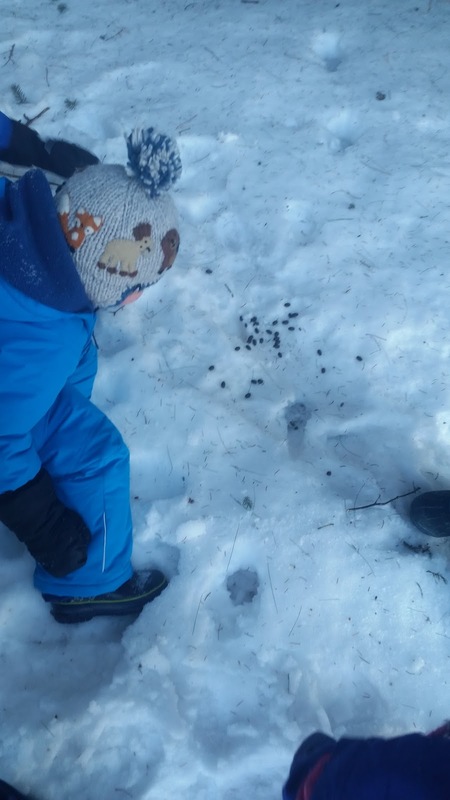 During our hike, a couple of students found a large stick and together they placed it over deep footprints to create a bridge. It was amazing to observe the cooperation and teamwork between these two preschoolers. During our hike, the children found a wide open field of untouched snow. 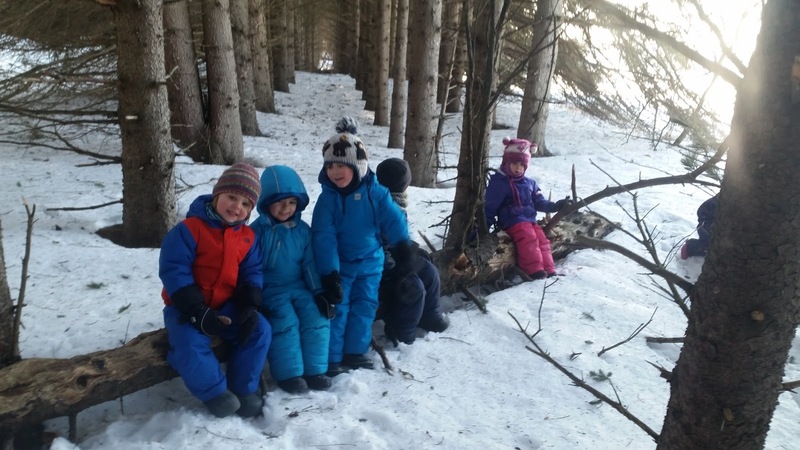 Some children were happy to find a place to sit in the sun and make hearts in the snow, while others eagerly raced to the top of a hill and rolled all the way to the bottom. We played a hide and seek game called "Hooty Hoot" where I challenged the children to find me when I hid behind a large tree and made an owl call. This led to a discussion about camouflage. 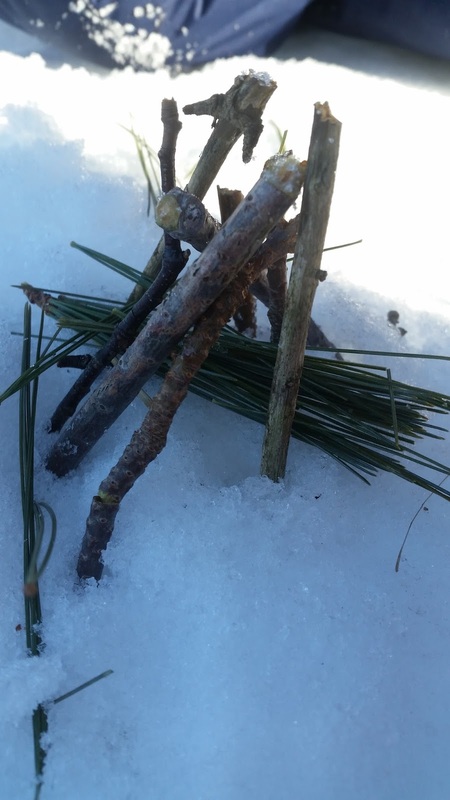 Since the air was warm, some children removed their mitts and created tents for forest fairies out of materials we found in the woods. According to one 4-year-old, his miniature fort, complete with a bed, was designed to make sure our magical sprites could find comfort during the cold weather. 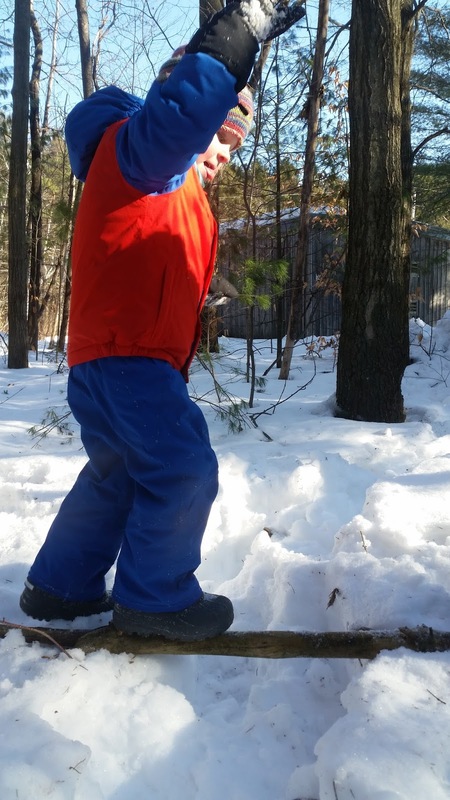 Back at the cabin, the children engaged in more imaginative play in our "Snow Kitchen". Cupcakes were baked and soups were stirred.There was a lot of storytelling during snack time today. Many children had bananas for snack and told each other their own stories through their banana phones. At the end of the day, we sat in a gratitude circle. Everyone had a chance to hold the talking stick and explain to the group what their favourite part of the day was. At the end, we all yelled in unison "thank you forest!"